VOCES helped me met my education goals by providing financial and resource support. Now, I work with VOCES. We are hard working, reliable, professional at all times, dedicated, willing to take on challenges, team players, and creative. We keep up with current therapy approaches, and we can work with all ages of clients. Start with high quality therapy, love what you do, be honest and trust in yourself. You will do great things in the lives of your students. I find it very interesting and rewarding to serve a population of patients that need specially trained therapists to provide effective interventions. Early on working in a school, I remember I was constantly educating staff members on what it means to provide bilingual language support to the bilingual students. It was eye-opening for staff and me to realize how little is known about bilingual language development. My passion as an SLP quickly grew to work with bilingual children and be their advocate by providing accurate information to educators working with these populations so that children get the services they need – without being over or under-identified, which are very real concerns with bilingual students. What inspires me in my work with bilingual students and families is that they are full of gratitude. More importantly, we are giving them access to information and strategies that they can use to make a difference in their homes. 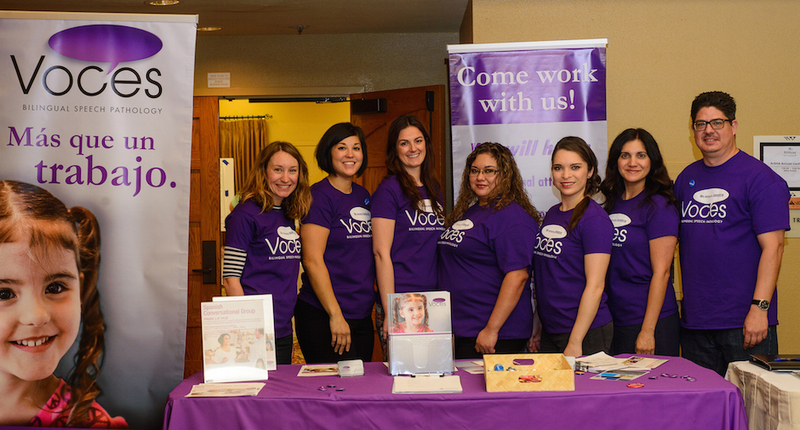 The VOCES team carefully selects therapists who have a heart and love for the work we do. We are surrounded by knowledgeable and caring therapists. I’ve known about VOCES since undergrad when I was awarded a scholarship from the company. Now, as an employee, VOCES continues to support me and provide all the resources and assistance I need to be a good therapist. Supervisors are only a call or text away, we have a generous materials and continuing education budget each year, and the caseloads are manageable. VOCES takes care of its employees! New therapists are in good hands. You will succeed as a clinician here. Working with VOCES gives me the opportunity to put all my passions together while getting to work with many talented and inspiring colleagues, students, and families. One thing I really appreciate about being a bilingual therapist is getting to support the child’s primary language and culture, which I don’t think is valued as much as it should be in Arizona schools today. I love meeting the parents who want to be involved but feel left out due to language barriers. Without parent involvement, my job is much harder to effect long term change. I’ve had some great experiences getting parents involved the the therapeutic process so they can continue to work with their children at home. Working together, everyone wins! Working with VOCES has been such a rewarding experience for me in so many ways. As a new clinician, it means so much to have the support of a group of highly experienced SLPs and staff that are all so willing to help. All of my VOCES colleagues are uniquely qualified to educate teachers, parents, and whoever wants to listen about effective ways of supporting bilingual children with speech or language delays. While there are so many school staff members and parents that do not have this knowledge, VOCES therapists bring this expertise. Are you a bilingual SLP who wants to advocate for bilingual children and have manageable caseloads and excellent compensation? Apply to work with us! Do you have questions about working with us? Contact VOCES owner and founder, Guy Garcia.